Dried jasmine flowers are added to sachets and other love mixtures. They will attract a spiritual - as opposed to physical - love. The flowers will also draw money and wealth if burned, carried or worn. Jasmine will also cause phrophetic dreams if burned in the bedroom. 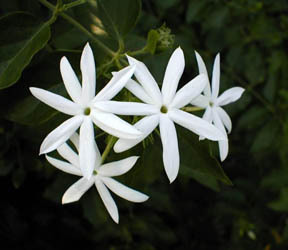 Egyptian Jasmine is one of our top sellers...a floral smell you must try!